Aroma Magic Neem & Tea Tree Face Wash lighten acne scars, blemishes & improve skin tone, prevent black heads & soothe skin irritations. For oily skin. 100% free of paraben, soap, alcohol, artificial colouring & fragrance. Acne control and oil balancing. Cure acne with neem and rose extracts. 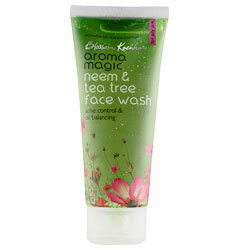 Help prevent blackheads, soothe skin irritations & bacterial eruptions with blend of tea tree & lavender essential oils. Vitamins in lighten scars, blemishes & improve skin tone. Sunscreen essential. Avoid use on dry, sensitive skin. Reduced acne and break outs to a large extent. Controls oil secretion for 5-6 hours. Apply to moist face & neck. Massage & rinse off properly.